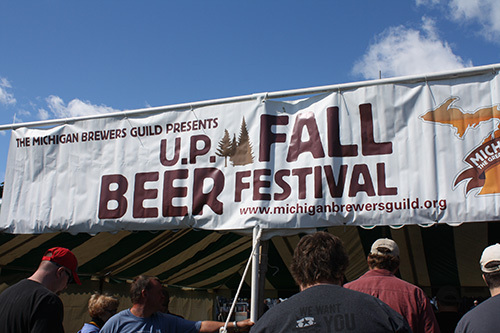 If each Michigan Brewers Guild beer festival were a person, they’d all have their own distinct personality. 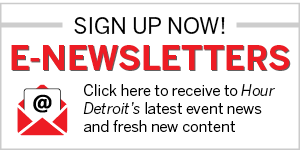 The Winter Beer Festival would be the extreme adventuresome outdoorsy type and the most popular one of the bunch; the Summer Beer Festival would be the party animal, a little bit on the wild side; the Detroit Fall Beer Festival would be somewhere between Winter and Summer, still fun-loving but tamer and sometimes clad in a Halloween costume; and the U.P. Fall Beer Festival is the laid-back type – think Matthew McConaughey in pretty much everything else other than True Detective. Now in its sixth year, the U.P. Fall Beer Fest saw its largest attendance numbers yet, with 4,100 people descending upon Lower Harbor Park on the shores of Lake Superior in Marquette on Saturday, Sept. 6. This fest has been the smallest one in terms of attendance for the Guild, but over the years it has been getting bigger and bigger, and it’s sold out two years in a row. Featuring more than 50 breweries and more than 400 craft brews, the fest offered a diverse taste of the Mitten State’s bounty of beers as well as a chance to sample beers from U.P. breweries that don’t make it to the other festivals in the lower peninsula. The festival also caps off U.P. Craft Beer Week, which showcases the region’s growing craft beer culture. One of our first stops was at Short’s, strategically placed near the entrance as you walk in. The Bellaire brewery just celebrated its 10th anniversary this year and is showing no signs of stopping. We chatted with the team and learned they’re preparing to open the expansion to their brewpub downtown, hopefully by the end of the year. They’ll add 50 seats as well as a retail storefront. Back in Marquette, there were plenty of new beers to try, including the Gitchy Gitchy Ooh La La, an experimental kolsch-style brewed with lilac, lemon, and cucumber that ranked among the most unique flavors we had all day; Space Rock, an American Pale Ale with a crisp and clean aftertaste; and the Thimbleberry Crush, a Berliner Weiss that was a brilliant red, thanks to the hand-picked thimbleberries from the Keewanaw Peninsula. Then there’s the Oblivion, a Belgian Quad that could be your last beer if you don’t pace yourself. When it comes to a refreshing, extremely drinkable IPA, Kuhnhenn Brewing Co.’s DRIPA (double rice IPA) is usually one of those beers on which we use one (or two or three) of our tokens. This year, the Warren brewery also brought along a bevy of fruit-infused brews, such as the luscious Pure MI Peach lager. Most breweries offer some kind of bourbon barrel beer, but one not to miss is the intense Bourbon Barrel Aged Plead the 5th from Dark Horse Brewing Co. This Russian Imperial Stout is one of the most sought-after beers at any of the Guild’s festivals and inevitably runs out. Smooth, dark, creamy, and strong with an 11 percent ABV, this beer has wonderful chocolate and bourbon aromas with notes of chocolate, vanilla, and bourbon. Speaking of stouts, we made sure to stop by at Founders’ table for the tapping of KBS, an imperial stout brewed with coffee and chocolates then aged in bourbon barrels. With intoxicating aromas of vanilla and bourbon, it never disappoints. Some of the newer breweries to sprout up since craft beer in Michigan started booming brought their A game such as Brewery Ferment. The Traverse City brewery’s Worker’s Fuzz cream ale was like biting into a real peach; there were no overly cloying sweet flavors that sometimes come with fruit beers. But we were really blown away by the Ital is Vital, an imperial oatmeal milk stout with coconut and scotch bonnet peppers. It was smooth and mellow, thanks to the coconut, but then it hits you in the face with a surprise spicy punch. This complex beer was a real treat. Another brewery we make sure to visit at each fest is Holland’s Our Brewing Co. This small brewery in downtown Holland produces top-notch beers, such as the popular Careless Whisper IPA. At each festival, they’ll bring some outrageous yet oh-so-delicious beer; one year they had the Elvis, which was a peanut butter and bacon stout. At the U.P. fest, they brought a Pumpkin Pie Milk Stout, a rich and creamy delight with the flavors of fresh pumpkin. Each festival showcases the season, but the U.P. fest offers the best of summer (such as peaches and even corn) and autumn. Local favorite Ore Dock Brewing Company offered a Rhizome Rye, subterranean shoots of ginger through rye. Not too spicy, this pale ale was a great summer sipper. To represent fall’s flavors, we saw a lot of pumpkin-inspired beers, such as Griffin Claw’s Screamin’ Pumpkin Ale, a very smooth, drinkable ale with aromas of pumpkin and spices such as cinnamon – the only things missing were a bonfire and some chairs. Any fall festival would be incomplete without cider. To meet our cider needs, we headed over to Vander Mill, which served up favorites such as Ginger Peach and Totally Roasted, which is delicious apple pie in a glass. Need for mead … and pastie beer? B Nektar in Ferndale featured popular concoctions, such as the excellent Zombie Killer Cherry Cyser, the cure for the apocalypse. With a magical blend of Michigan honey, cherries, and apple cider, many people came back for seconds and were sorely disappointed when it ran out. There were still other good choices, such as the Almond Joy, boasting flavors of the popular confection such as chocolate, coconut, and almonds. But the most unique beer we had all day was the Troll’s Offering, a pastie beer brewed with potatoes, carrots, and rutabaga. But wait, there’s more: It was served with a ketchup rim. It definitely tasted like everyone’s favorite meat pie, but we’re still figuring out if we liked or hated the ketchup rim. But when in the U.P., right? Next year, we’ll be looking for the smoked whitefish beer.